Google Analytics (GA) is a must-have tool for school marketing professionals. Whether you would like to find out which online campaigns give you the most traffic, learn more about your audience or find out more about what people are searching for on your site, Google Analytics will help you get the most out of your analytics information and use it to improve your blog, website content and user experience. School marketers need to know how to choose the right marketing metrics right from the start. Here are some core components of GA that you may find helpful. One of most insightful aspects of digital marketing is the ability to understand exactly how customers are finding you. This vital element of GA allows you to determine which marketing efforts are working and what needs to be revised. Google Analytics allows you to hone in on the performance of different marketing channels to evaluate everything from search engine optimization (SEO) to email marketing. Here are the different channels you can review in GA.
Organic search refers to the visitors that came from organic (unpaid) search results. Month on month and year on year increases to organic traffic represents a strong SEO strategy. The results of this report are determined by the medium of organic traffic such as Google, Bing or Yahoo. Traffic from tagged links clicked in email messages, whether mass email blasts or individual messages. You can add a tracking link to the URLs in your emails by using Google URL builder tool. Tagging your links will help you further segment this traffic by campaign. This way you can see which email campaign(s) are the most successful over a period of time. This measures traffic coming from users clicking a link from another site, excluding major search engines. Traffic from pay-per-click (PPC) campaigns such as Google AdWords. You can also link your AdWords campaign to GA for more efficient reporting in GA, under Acquisition. Google defines “other traffic” as traffic coming from online advertising outside of search and display, such as cost-per-view video advertising. Occasionally you will have undefined traffic in this report which GA will eventually filter out to the appropriate channel. Indicates traffic from display advertising, such as Google AdWords remarketing campaigns. Here’s a screenshot with an example of different channels. Exclusive FREE Bonus: Download the pdf Basic Google Analytics Guide Schools Can Use to Improve Inbound Marketing Efforts to reference in the future and/or share with colleagues in your school. Within the site content section of GA, there are four really insightful sub-sections to consider. With All Pages, you will find a list of all the pages on your site that have been viewed during a date range that you specify. If any of your pages are missing, they either haven’t been viewed during the date range you specified, or the tracking code isn’t installed properly on that page. Pageviews show you how many times the page was viewed during the date specified. This can be the same user multiple times in one session. Unique Pageviews show how many unique sessions there have been for a page. Average Time on Page is the average time spent on the page over a chosen date range. Entrances calculates how many times a page was the entrance page to the website, meaning the first page that the user viewed. Bounce Rate is a calculated as a percentage of the number of visits in which a person leaves your website from the landing page without browsing through other pages. % Exit is the percentage of Pageviews that were the final page before a user left the website. Page Value is calculated using ecommerce, dividing the total dollar ($) value by the number of pageviews for the page, so you can ignore this if you do not sell items online through your website. Content Drilldown gives you the same data as in the All Pages report (with the same user metrics mentioned above), but the data is provided in sub-folders. This section will show you how well your site is organized, and how well people are interacting with your content when navigating through your site. You can see the folder images next to the page path to determine whether this is a page or subfolder. As you can see in the example below, the homepage (/) is the main folder, with the icons underneath representing subfolders of the homepage. By clicking on the links, you will reach a more detailed breakdown about the corresponding pages within the folder selected. This report is particularly useful for showing you underperforming or low-value content that may be appealing to visitors that you may not be aware of. Here’s a screenshot from the Content Drilldown report. Landing pages are the only pages in the content reports that show you a conversion rate. This is because multiple pages can be viewed within single visits before a conversion happens, but there will only be one page that a visitor lands on. So, if someone landed on your Admissions page prior to navigating through your Admissions sub-pages, before completing a conversion, the Admissions page will count as the page that generated the drill down. This data can be segmented by adding a secondary category such as the “Source or Medium” on the Landing Page report. This will allow you to gain a better understanding of the pages which perform well through Sources or Mediums such as Google, Yelp or Google AdWords. Being able to identify which pages are the most popular and generate inquiries is vital when analyzing marketing performance. Exit pages are the final pages viewed within a visit. Usually, contact pages tend to rank high in this list, which is ideally where you want to see the “visitor journey” finish. Monitoring this report is key to understanding which pages could use improvement in order to keep users on your website and drive them towards completing the contact page or another conversion. This will always be an exceptionally beneficial analysis when considering your digital marketing plan. Keep an eye out for pages high on the list that may have an error message like “404 Page Not Found.” Fixing these are ways to quickly improve the user journey and overall website performance. Be aware of your audience demographics. It is the key to targeting your marketing efforts. The audience section in GA is very important to note. Here you can really dig deep into user statistics for your site, and therefore gain a deeper understanding of the type of people who are engaging with your content, completing your forms and inquiring about your school. The audience tab gives you a broad overview that helps you gain an initial understanding of users’ behavior. This will give you essential information you can use to form the hypothesis to develop your optimization strategy. Then you can start to dig deeper, mining the different reports for more audience insight. Do bounce rates vary significantly between desktop and mobile visits? If you have a much higher bounce rate for mobile visits than desktop, despite having a similar visit count for both, you should consider revising the mobile experience for users. Which segments account for the highest Goal Conversion Rates (i.e., Inquiries)? Are women aged 30 – 45 submitting the most inquiries about your school? You can use this type of data to help target your audience more efficiently. Once you’re able to identify better the demographic and device segments that demonstrate a high conversion rate on the site, then you can target that specific audience via Google, Bing or social media advertising campaigns. Below is an example of segmenting data from mobile users. Here I have added in the age dimension and sorted the list in order of bounce rate. You can see that users aged 18-24 have the highest bounce rate percentage, meaning they are the most impatient group when visiting this particular website on their mobile device. Measuring – and analyzing the data measured – is the key to improving your marketing strategy for your school. Using Google Analytics will move you away from guessing and help you to understand who is visiting your website and the ways in which you can make data-driven improvements to your digital marketing strategy. 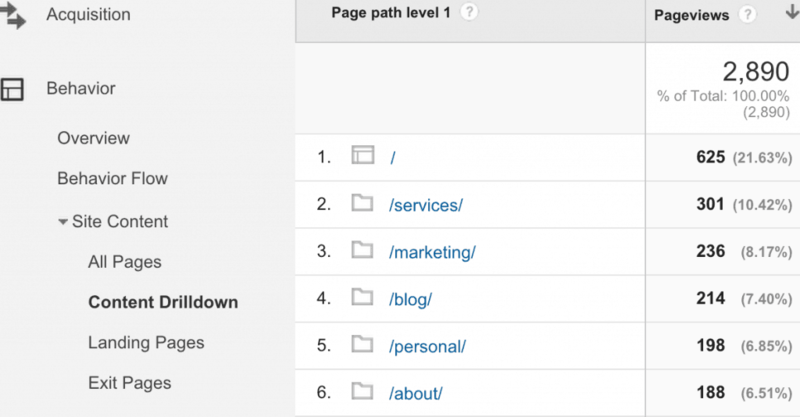 Do you use Google Analytics to track, measure and analyze your marketing efforts? What is working – or not working – for you? Please comment below!